The twists and turns in the life of Ashikaga Yoshimasa, who built the Silver Pavilion, would have made a good Shakespearean tragedy. He never expected to be the Shogun (the feudal military dictator) but the death of his older brother, following a fall from a horse propelled him into the role at the age of ten. By 1464, when Yoshimasa was 28 there was still no heir and so he appointed his younger brother Yashimi, but the following year Yoshimasa’s wife Tomiko gave birth to a son creating a rivalry for the succession. The Askikaga clan had moved government to Kyoto in the period from 1368 and was the weakest of the three Shogunates that ruled medieval Japan, relying heavily on the prestige and force of personality of the Shogun at a time when the power of the daimyos (local feudal lords) was greatly increasing. The simmering dispute between clan factors and the daimyos became an armed conflict, known as the Onin War, and in the midst of the hostilities Yoshimasa relinquished his nominal position in favour of his son and retired to the calm, beauty and tranquillity of his villa although still wielding some power. It was only when his son died prematurely and his brother had also passed away that the dispute was resolved by Yoshimasa adopting his brother’s son as heir, and then he was able to retire for a second time becoming a Zen Buddhist monk for the last five years of his life. 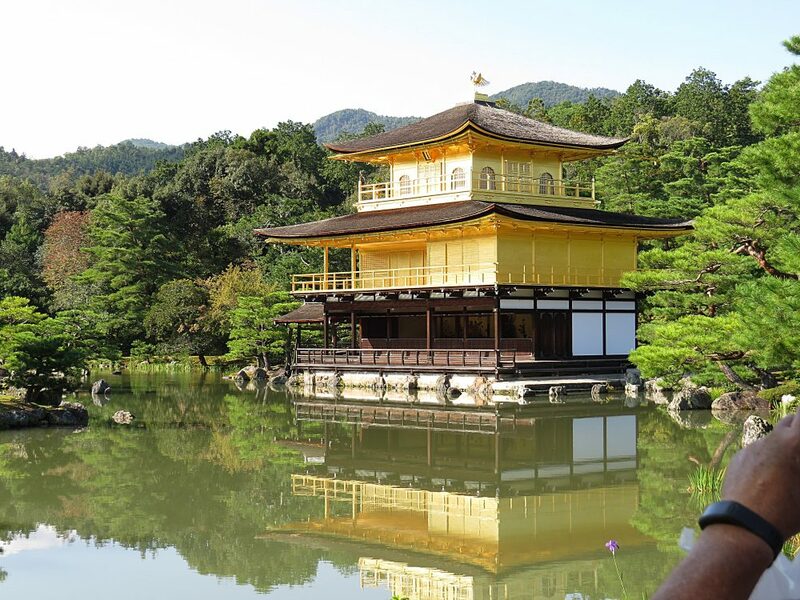 Inevitably Yoshimasa’s Silver Pavilion is compared to his grandfather Yoshimitsu’s elegant three storey villa, the Golden Pavilion, set beside a lake and spectacularly covered in gold leaf. 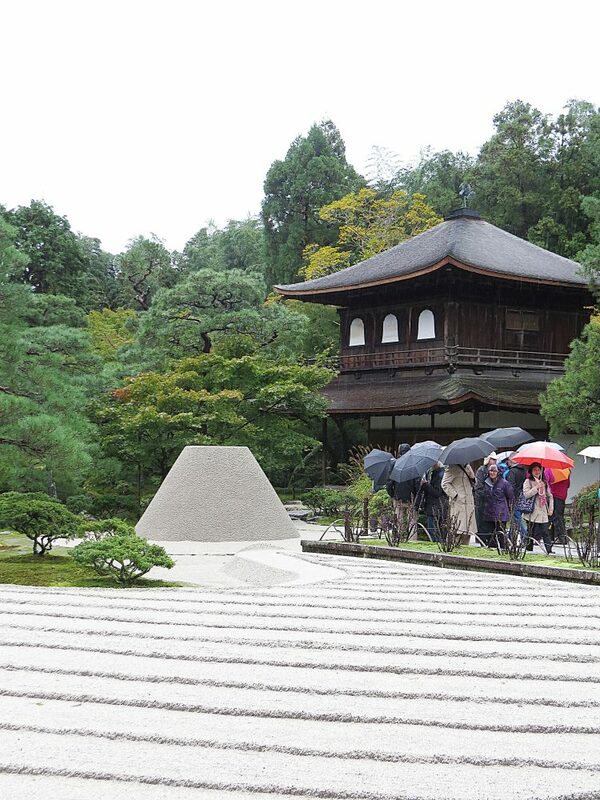 There are several theories as to why it is called the Silver Pavilion; perhaps Yoshimasa’s more troubled times impacted on the spending and prevented it being covered in silver leaf, perhaps it referred to the moonlight on the roof, or (my favoured explanation) that it referred to the reflection of the shimmering quartz sand of the dry garden on the lacquered finish of the woodwork. I think it seems unlikely that someone who wished to retire as a monk would have wished to be so ostentatious as to cover his pavilion in silver leaf. Built in 1482, there are two main buildings on the site, the larger being the two-storey Kannon-dei (the Silver Pavilion), the lower floor being the shogun’s residence and the upper a Zen temple. 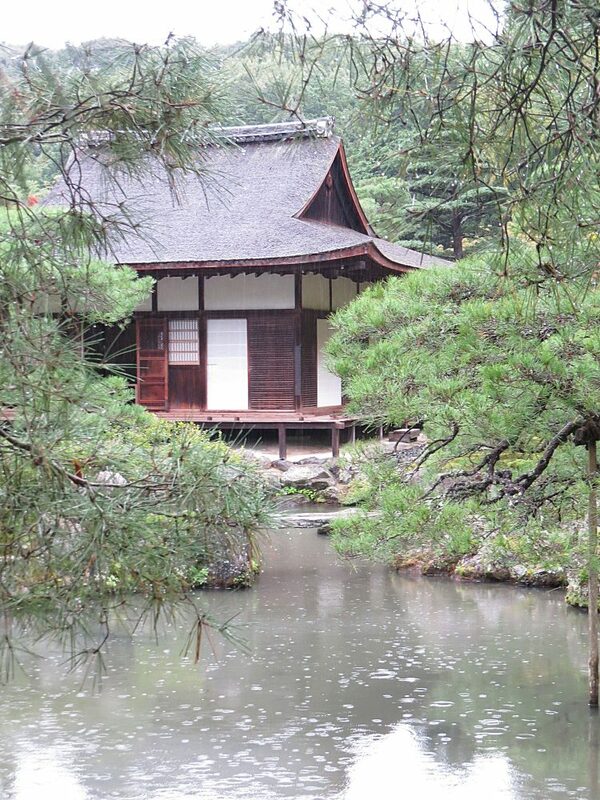 The second building set in the grounds is the Togu-do, a Buddhist hall thatched with Japanese cypress. 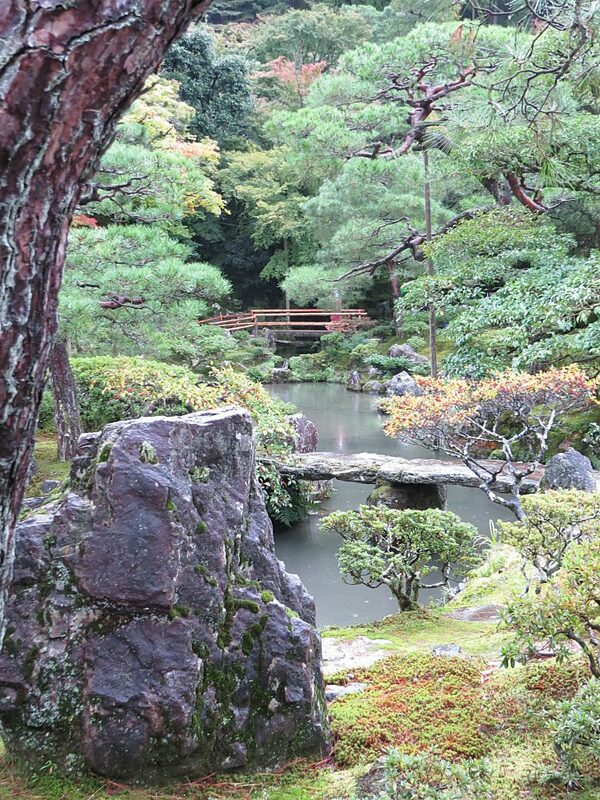 What the Silver Pavilion lacks in glitzy splendour it makes up for in the quality of its classical stroll and dry gardens, believed to be designed by the great landscape artist Soami. The impressive approach to the pavilion and garden is a straight 50 metre long avenue flanked to each side with very tall carefully trimmed camellia hedges above a bamboo fence and set on a cut stone base. A sharp left turn reveals the remarkable dry garden with its glistening coarse sand raked in straight lines and with a tall truncated gravel cone set towards one end. Unlike many of the more famous temple dry gardens it is not enclosed by a wall and visually links with the adjacent stroll garden. Whereas most dry gardens are viewed from a seated position in a single storey temple, here the garden is over-viewed from the temple on the upper level of the pavilion. There are many conflicting theories as to the meaning of the cone, but the best dry gardens are enigmatic requiring contemplation to reach a moment of Zen enlightenment, and I suspect that this is its real purpose. 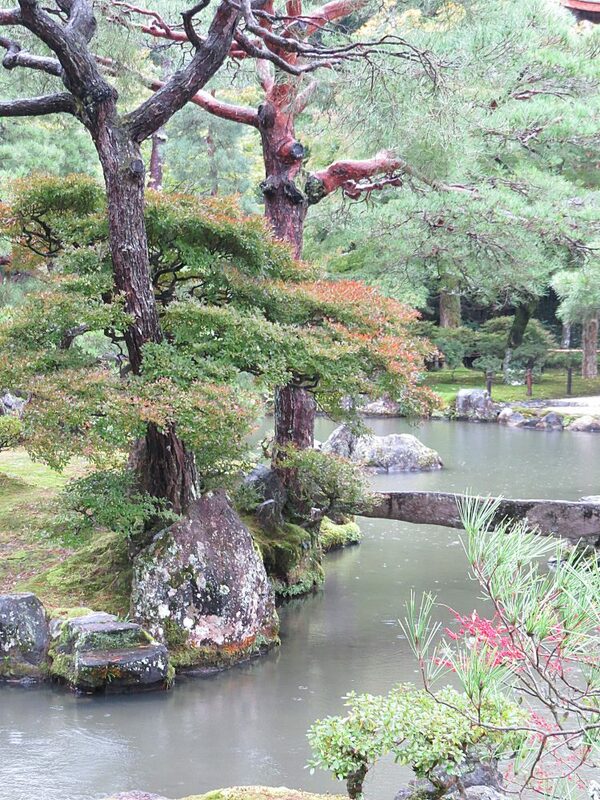 The classical stroll garden is particularly fine, set on a mountain side with many carefully composed picturesque views of ponds, stone and timber bridges, cloud-pruned trees with snaking roots, thick hummocky moss, and carefully positioned pieces of interesting rock. 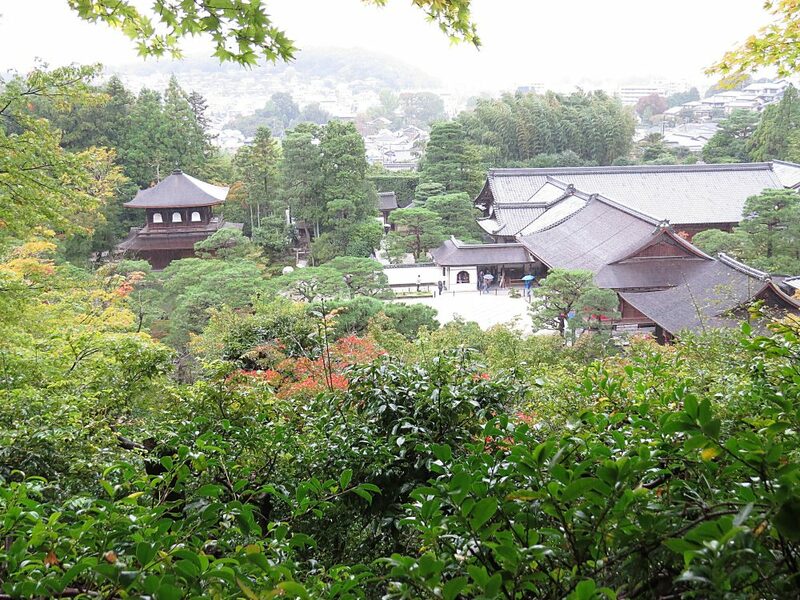 Unusually there are also spectacular views over the temple in the direction of Kyoto. 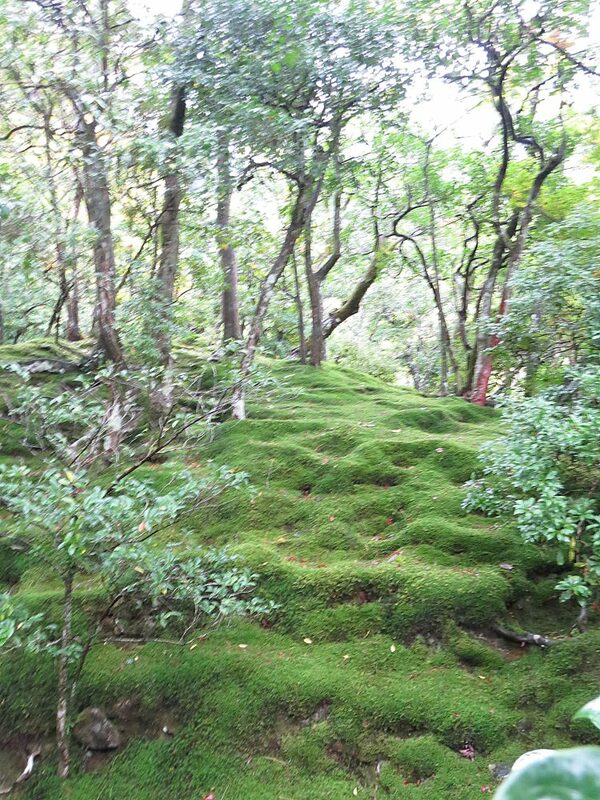 My visit to Japan was an introduction, and I saw fewer than twenty dry gardens and stroll gardens, whereas in Kyoto alone, more than twice that number have survived. There is much more to see and without doubt I will be back, and a second visit to this spectacular garden will most definitely be on the itinerary. Website: the official website translates very poorly into English. Use Kyoto guidebooks.